On Friday, 25 Aug, Atham ( Moon's tenancy of the constellation of Delta Corvi or Hasta ), began, initiating the start of the Ten Day Harvest Festival, It is a Festival of Agri Prosperity. 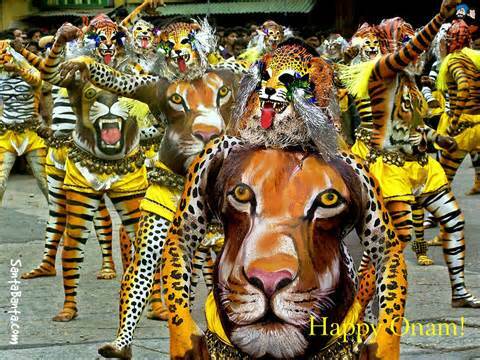 Onam is symbolic of the humiliation of the Ego, the dominant force in Man. The Ego is the lower imperfect term in us. Self is the higher, perfect term. Ego represents our animal aspect. Self represents our divine aspect. Deceived he was by Thee ! As a punishment to his Ego ! And accept our salutations ! ten day Harvest Festival begins. Hence Atham assumes sacred significance. People go to local Temple and offer prayers, thus beginnings the rituals of Atham. Pappads are fried and steamed bananas, considered highly nutritious, are taken in for breakfast. This is the breakfast adopted for all the ten days of this festival. different days Girls compete to make the best Pookalams ! by elephant processions, dance, music and folk art presentations. by creating magnificent Pookalams ! The Moon tenants Swati or Alpha Bootis and this day is called Chothi in Sanskrit. the ten day festival. Shopkeepers come with concessional schemes to lure customers. and pappads. Also Payasams or puddings. Vallam Kali or Snake Boat Race happens on the Fifth day of Onam. Moon tenants Delta Scorpi. This immemsely popular event happens on the banks of the irver Pamba at Aranmula. Global tourists witness this great event. hundreds of oarsmen, these vallams vie for supremacy ! 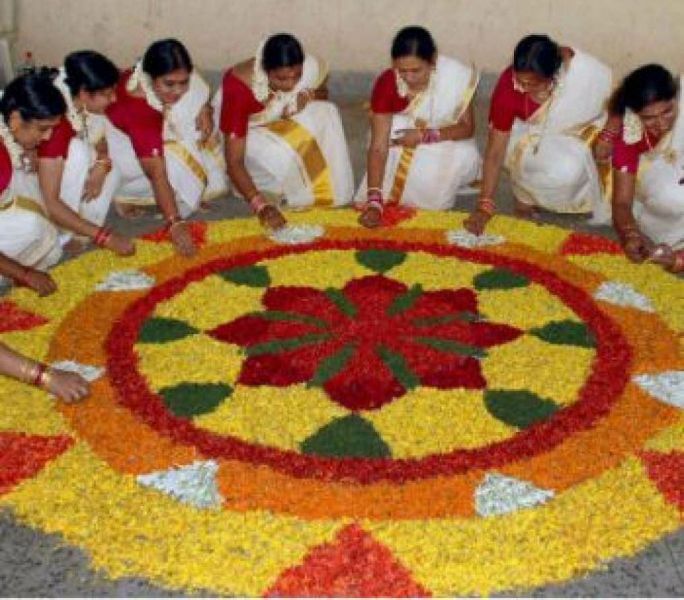 Women add more flowers to the Pookalams and gear up for Thiru Onam. 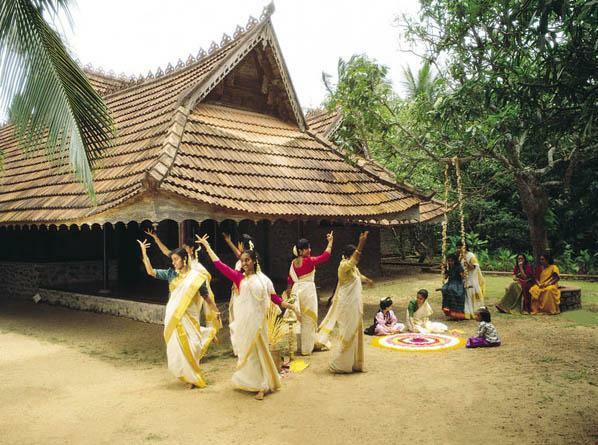 Govt has declared Onam as the National Festival of Kerala. Pookalams get better designs and fresh flowers ! Different Athira Song and Dance. Of golden, divine Athira ! Onam. Shops will be full of goods, enticing the populace with freebies. People do their last bit of shopping. Joy and euphoria pervade everywhere. They are going to meet their Onathappan. Celebrations and exhilaration that the long wait is about to end. anticipating the arrival of Lord Maveli. bigger. People go on a shopping spree. as Onam fever grips the province. Houses are cleaned to see that they are tidy when Maveli arrives ! The penultimate day of the Onam Harvest Festival is marked by great jubilation, as people are ready to welcome ths Spirit of Maveli. In some parts of Kerala, Onam starts on the this day before Thiruvonam. Some people call this Uthradam as the First Onam and the next day as the Second Onam. The Chief of a family is called Karanavar and dependents of a Nair Tharavad bring their horticultural produce to this Chief. The Chief treats them to a super meal. The horti produce which they bring is called Ona Kazhcha. Handicrafts are also brought by village artitsts and the Chief rewards them in plenty ! New designs grace the Pookalams and houses are cleaned up for the great event next day. Great Felicitations, Thiru Onam Asamsakal greet all during this glorious day, a day of plentitude. All are wished Onam Felicitations ! During this day, the spirit of King Maha Bali grace Kerala, so runs the legend. Early morning houses are cleaned up to accomodate the spirit of the benevolent King. All wear new clothes. 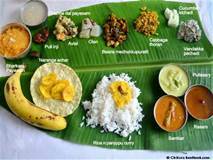 A sumptous meal consisiting of 11 dishes are prepared for the Ona Sadya, the Great Feast of Onam. Clothes are gifted to family members.Many a cultural event grace the Province. The major celebratoins get over on the Tenth day, even though many celebrate the next two days, Avittom and Chathayam. 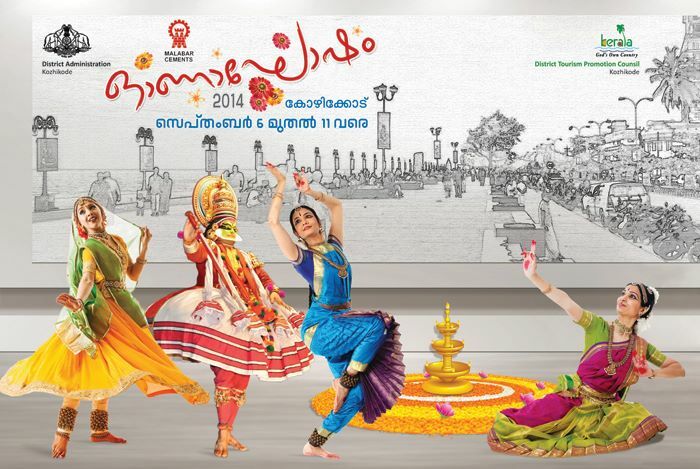 Kerala diaspora publicise Kerala's greatest Art ! Heaven on Earth is Kerala, Mannile Vinnanu Keraleeyam.